Significance : Relics of St. Francis Xavier is kept. This world heritage monument built in 1605 is a fine example of Jesuit architecture and has emerged as a landmark in the history of Christianity. 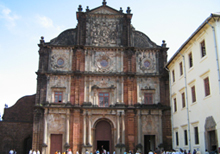 It is situated in Old Goa, 9kms from the Capital Panjim. It is a world renowned church which contains the body of St. Francis Xavier; a pupil of the soldier- turned - saint, Ignatius Loyola (the founder of the Order of Jesuits), who died while on a sea voyage to China on December 2,1552. The following year, while transferring Francis Xavier's remains to Goa, in accordance with his wishes, it was found that the saint's body was as fresh as the day it was buried. This miraculous phenomenon attracts huge number of devotees from all over the world, especially during the public viewing of his body every ten years. The saint is believed to have miraculous powers of healing, and pilgrims would come from all over the country to offer prayers. 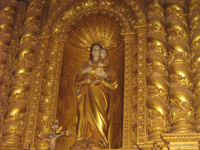 This church is one of the richest churches in Goa and is carpeted with marble flooring and inlaid with precious stones. Apart from the elaborate gilded altars, the interior of the church is simple. The church also holds paintings of St. Francis Xavier. The Tomb of St.Francis Xavier (1696) was the gift of the last of the Medicis, Cosimo III, the Grand Duke of Tuscany. It was carved by the 17th century Florentine sculptor Giovanni Batista Foggini. It took 10 years to complete. The casket containing his body is made of silver. The holy relics of the saint is displayed every 10 years during the anniversary of the Saint's death. The Feast is organised on 3rd December every year. The Basilica is open to visitors from 9 am to 6.30 pm on weekdays and from 10 am to 6.30 pm on Sundays. Masses are held at 8 am and 9.15 am on Sunday and at 7 am and 8 am on weekdays.